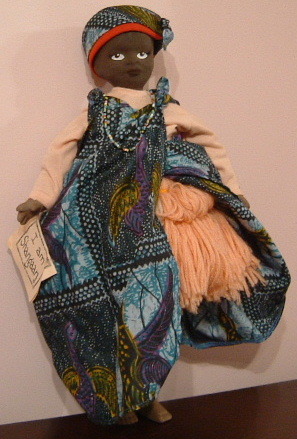 The dolls here came from the Carousel Collection of Tribal Dolls of Southern Africa. 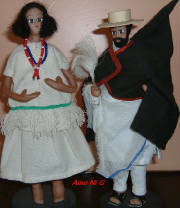 In the literature that came with the dolls it states that this collection has been created in an attempt to caputre the customs and dress of the tribes before they are engulfed by Western culture. 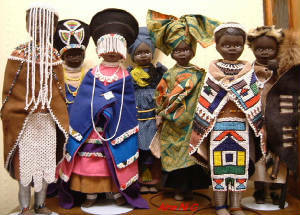 Each doll head is made of ceramic which is indigenous to South Africa. The faces are handpainted to depict the gentleness and serenity of the tribal women. The costuming has been thoroughly researched and great care has been taken to ensure that all fabric patterns and beadwork are those favoured by the respective tribes. 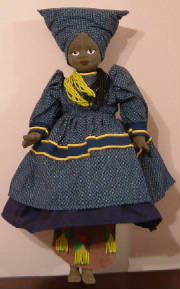 The authentic costuming has been approved by the Africana Museum in Johannesburg, South Africa. The dolls illustrated here are approx. 17" high. Each one carries with it a label describing his or her tribe. I am Maragka of the Ndebele tribe. My name means "beautiful". My MAPOTO is the apron of married status. encircling my neck, arms and legs are brass, copper or steel hoops, some of which are built on to my body from childhood. My tribe is know for its very colourful beadwork and brightly patterned houses and murals. Designs are often geometrical intepretations of day-to-day articles and patterns and colours carefully balanced. I am Betty of the Ndebele Tribe and I am a bride. 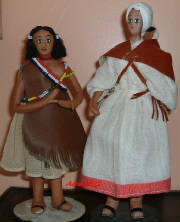 My bridal apron is called a STHOGOLA and I am wearing a LINAGA which is a traditional goatskin cape. My beaded veil is called a SIYAYA and the beadwork at my back is called INYOGA. My metal leg hoops are called TSHILA. The beaded headdress from which my SIYAYA and INYOGA hang is called a MOKHALA. I am from the Kingdom of Swaziland, a green and hilly, very beautiful land with many rivers and streams. We take pride in our appearance, especially our hair and traditionally handcarved morrors and combs are prized possessions. A young girl will wear her hair in oiled ringlets, but a married woman puts up her hair in a topknot which, if cut off, upsets her husband as it implies that she wishes him dead! It may only be cut off if she is widowed. I am of the Pedi Tribe of the Northern Transvaal. My smock is large, with apmple sleeves and it is decorated with contrast stripes and piping, and is usually of a finely patterned blue material. It is an emblem of fruitfulness and a proud mother status. The goatskin underskirt is decorated with beaded medallions. Necklaces are numerous. I am a man of the Sotho tribe of Lesotho. The language I speak is sesotho. I am wearing a typical Basotho blanket which traditionally, for men, must be fastened on the right shoulder, allowing the right arm to be free for protection. Our blanket patterns are often symbolic of history although the KWENA (crocodile) symbol of King Moshesh's tribe is popular. I am Palese of the Sotho tribe who live in the mountain kingdom of Lesotho. My name means "flowers". I am a bride. traditionally, my blanket must be fastened in front, over my breasts. When I get married, I carry my grass sleeping mat to my husband's home. I am Thandi of the Zulu tribe who live in Natal and Kwa-Zulu. 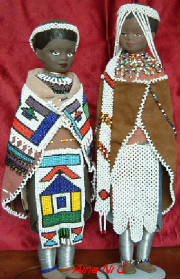 I am a bride as is shown by the Hlonipa (beaded veil) on y Isicholo (headdress). My Isidwaba (leather skirt) of goatskin or calfskin was made especially for my wedding by my grandmother. The groom will have paid Cobola (bridal price) of at least 11 cows to my father for me. Zulus, being a polygamous nation, may have several wives. I am Fiskisiwe of the Zulu tribe of Natal and Kwa Zulu. My name means "present or gift". I am wealthy, as indicated by my many beads. 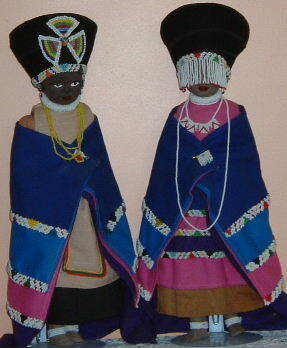 My ISICHOLO (head-dress) has many beaded motifs and an ISITHWALO (a beaded headband). I am wearing and ISIGEGE around my neck. I will sleep on an AMACANSI (sleeping mat) with an ISIGQIKI (handcarved neckrest) under my neck as I do not take off my ISICHOLO for 6 months or more. I am Mandla of the Zulu tribe of Natal and Kwa-Zulu. I am carrying an IHAO (shield), an ISADJULA (a hunting spear only given to married men), and an INDUKU which is my fighting stick. The decoration on my IHAO is called AMAGABELO and serves the purpose of keeping my shield rigid. i sometimes carry and ISIPAPA (a throwing spear) or an IGWA which is the short stabbing spear designed and put into use by King Chaka. I live in an UMUZI (village) and enjoy drinking UTSHWALA (beer). I am TSAKANI of the Shangaan tribe. My name means "happiness". I am wearing a skirt of wool, which is called XIBELANI and over this I wear a MICHEKA, The brightly coloured, patterned cotton blanket. My headdress is called IDOEK. The language we speak is called Tsonga. 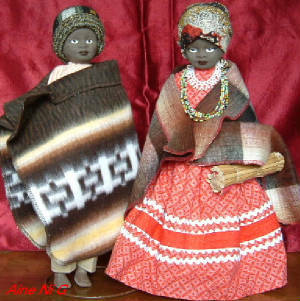 These lovely little 8" handcrafted dolls from Ethiopia were purchased from the Ethiopian Tourist Trading Corporation. 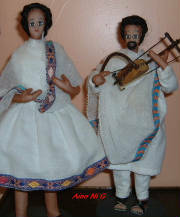 They have wire armature bodies covered with stockinette, they have beautifully handpainted features and jet black frizzy hair. Traditional Ethiopian clothing varies greatly according to its wearers status and wealth. The most popular garment being the Shamma worn by both men and women. The material used is cotton, calico or muslin, usually white in colour, with a woven border. The women wear the Shamma over a long white dress which often has a woven border matching the Shamma. 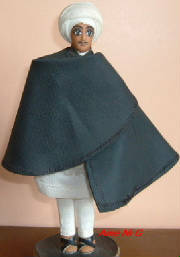 Men also wear the Shamma over a long sleeved white tunic shirt, which is worn outside long white trousers.